Be the first to share your favorite memory, photo or story of James 'Jack'. This memorial page is dedicated for family, friends and future generations to celebrate the life of their loved one. 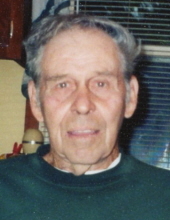 James ‘Jack’ D. Krause, 88, of Nora Springs, died Saturday, January 26, 2019 at his home. Funeral services will be held at 11 AM Monday, February 4, 2019 at the Major Erickson Funeral Home. Interment will follow in the Park Cemetery, Nora Springs. Visitation will be held one hour prior to service time on Monday at the funeral home. Jack was born July 6, 1930 the son of Elmer and Jeanette (Olson) Krause in Mason City, Iowa. Following high school Jack was drafted into the United States Army serving his country honorably during the Korean War. During his service he earned a Purple Heart. Following his return from service Jack was united in marriage to Beverly Keeney on April 25, 1954 at the First United Methodist Church in Mason City. To this union seven children were born. Jack’s passion, drive, life love and life fulfillment was centered around farming. One of his pride and joys was his Oliver G-955 that he bought brand new in 1974 for $14,000. He was a skilled welder, inventor and all around handyman. Jack was very particular, for those who knew him knew it was his way or no way. He was extremely stubborn and honest. His compassion for others was evident in his willingness to help anyone in need. Jack taught his children that working hard was the only way to success and that they needed to speak the truth. He helped them earn a wage by raising and selling sweet corn for many years. His family was very important to him. Jack enjoyed giving them rides on the Cushman scooter. As his grandchildren and great grandchildren came along he would give them rides around the farm on the 6 X 4 with the last ride given on September 22, 2018. Family outings would include trips to the Huff Drive-in for a cheeseburger and root beer float and sometimes Jack managed to find the time to take the kids for ‘Sunday drives’ in the Oldsmobile, which consisted of driving through McIntire, Iowa where he admired the Amish way of life. He also loved to take the kids to Threshers Reunion, by Charles City, to go see the tractors and steam engines. Jack enjoyed putting on hog roasts for his friends and family. His inventor and welding skills were put to use as he built his own hog roaster. He babysat the roaster all day long to reap the most tender and delicious meat. Jack had a couple nicknames one was Action Jackson and the other was the King and Beverly was the Queen. Jack was employed at Oliver in Charles City and the cement plant for a short time. Those thankful for having shared in Jack’s life include his seven children, Carolyn Krause of Forest City, IA, Barbara Paulson of Oskaloosa, IA, Pam Krause of Mason City, Rick Krause of Des Moines, IA, Susan Krause and fiancé: Duane Hanson of Rock Falls, IA, Dennis Krause and wife Bonnie of Rockwell, IA, and Linda Krause and fiancé: Dennis Henely of Plymouth, IA; 8 grandchildren: Jared Gardinier, Kodi Pinard, Andrew Mart (Amara Wanders), Joshua (Kelcey) Henely, Courtney (Nick) Kronemann, Hunter (Crystal) Krause, Melissa Pinard (Phillip Smith), Danya (Shane) Swanson and Drayce Henely; 3 step-grandchildren: Jason Cody, Jeremy Cody and Dion (Allison) Cody; 5 great grandchildren: Adrian, Angela, Bristol, Finley and Gabe; and many nieces and nephews. Jack was preceded in death by his parents, wife, Beverly in July of 2018 and two brothers, William ‘Bill’ (Mary) Krause and Robert ‘Bob’ (Phyllis) Krause. To send flowers or a remembrance gift to the family of James 'Jack' Duane Krause, please visit our Tribute Store. "Email Address" would like to share the life celebration of James 'Jack' Duane Krause. Click on the "link" to go to share a favorite memory or leave a condolence message for the family.